What says “grill master” more than grilling a whole chicken sitting on top of a can of beer that is infusing flavor and moisture into your bird? Beer-can chicken is often overlooked on the menu, but it’s a fun and proven way to grill a tasty whole chicken. Grab a whole chicken from the grocery store and beer or even some root beer or soda and get that thing on the grill for a guaranteed successful meal. 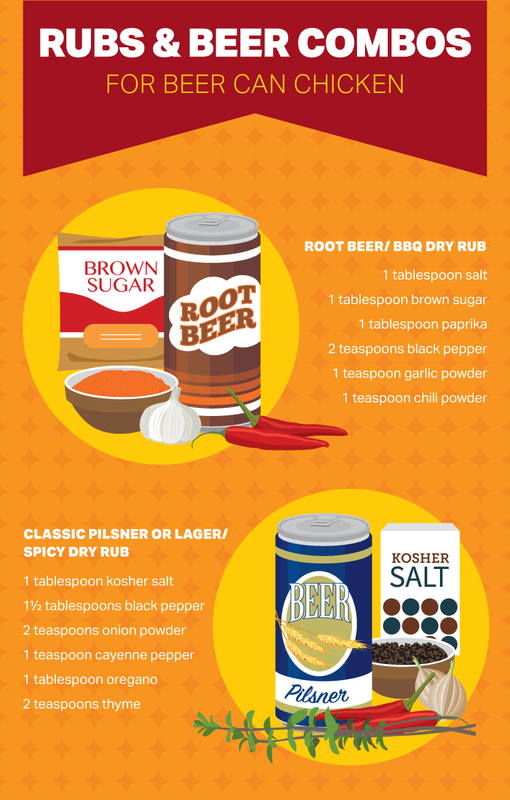 For those of you who choose not to grill with beer, the first recipe choice offered here is a BBQ root beer chicken. This flavorful bird has a classic BBQ dry rub on the outside and root-beer-infused sweet flavor and moisture on the inside. The bird is brushed with any BBQ sauce you like toward the end of the cooking. After cleaning out the chicken, mix the dry ingredients together (recipe is in the image below) and heavily apply this simple BBQ dry rub all over the bird. Place the chicken on top of a can of root beer and grill as instructed below. If root beer isn’t your thing, orange soda can be substituted in this recipe. The second recipe is more of a classic beer-can chicken that has a spicy dry rub applied to the outside. A classic pilsner or lager is used to provide moisture and flavor to the bird. The ingredients for the spicy dry rub recipe are in the image below. Want to become a grilling know-it-all? Check out the Gas Propane Grill Blog for all your need-to-know info! Now that you have applied your dry rub to the chicken, set up the grill for indirect heat. 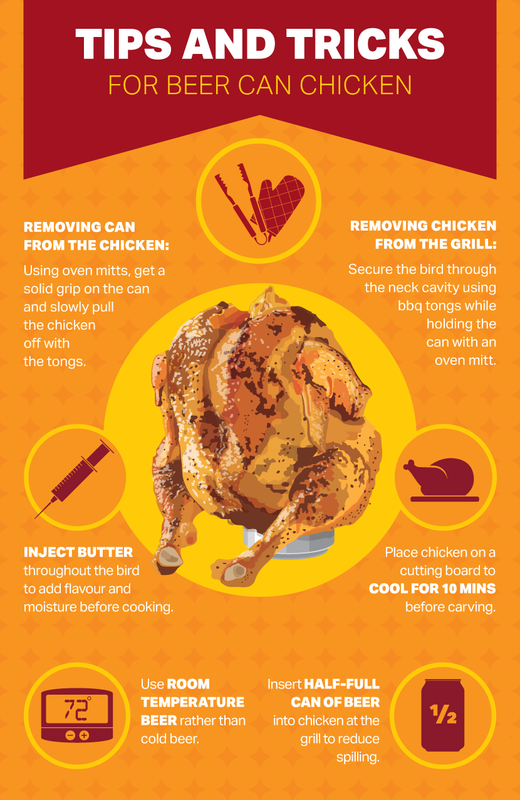 For indirect heat, place charcoal on half the grill and cook the bird on the other half, above an aluminum tin to catch drippings. Grilling the chicken at a more moderate temperature reduces the chance of scorching the bird on the outside and under-cooking the inside. On a gas grill, ignite the burners on only one side to medium high heat. You want the grill to be at about 400-425 degrees for grilling a beer-can chicken.